There are a lot of places to see in Kyoto. Some are very well-known and others are not. Some places in guide books are visited by so many people, especially in sightseeing seasons. We cannot enjoy those temples themselves, just looking its beauty and scene. 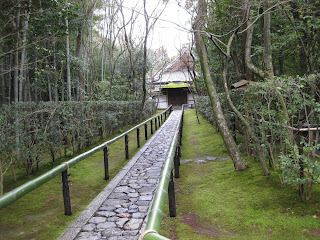 Why not visit Koto-in? It is one of the small temples in the precinct of Daitokuji temple. 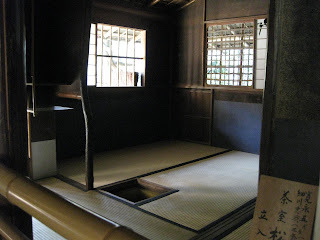 It is deelpy related to HOSOKAWA family, one of the feudal lords in 17th century. In this temple, there is the family's grave and the family's tea room. 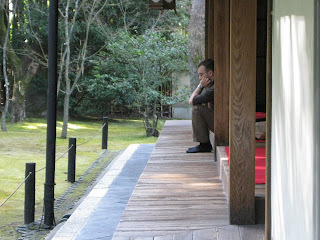 However, what I want to tell you more than anything else is a calmness of this temple. Once you step in the area, you will forget bustle of the big city. There exist a quiet calmness. Just sit toward the garden and listen to the sound of wind. Its calmness refresh your heart. When I took a tourist here, he said " However hard you try to put this whole thing in a picture, it is surely impossible. The breeze, the birds, air, shade, moss...everything makes you calm." Just stay here for a while and feel everything around you. Certainly, you will have peace in your mind.